Three of nine southern divisions against one of seven northern Corps. Reinforcements from II and V Corps and retreat to the original line resulted. There have been many things said of the July 2nd fighting. Perhaps more things have been said than ought to have been said. Perhaps Longstreet was slow. It was his nature to be thorough, to do it right, but to hit hard when the time came. However, seemingly by chance, Longstreet hit just after Sickles moved forward, but before Meade had opportunity to restore his fishhook line. By happenstance, in almost as fine a piece of accidental timing as at the Battle of Midway, Longstreet hit at the most opportune of times. Neither army fought as their commander had intended. Sickles moved forward. Mead had to reinforce him haphazardly. Lee had ordered an attack along the line of the Emitsburg Road, hitting the Union flank and rear. Lee's scout, Captain Johnson, reported getting to Little Round Top without encountering a Union soldier. Thus, the attack was planned assuming the Union III and V Corps were not present. The pink arrows are my own interpretation of the original intent. 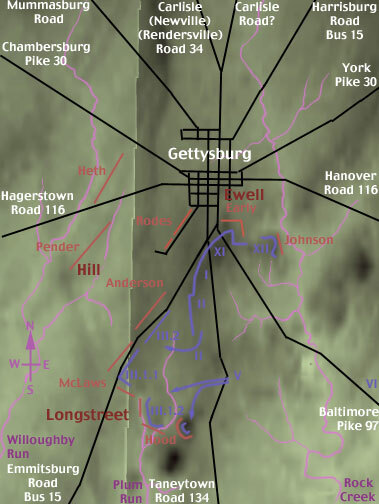 Longstreet's right was supposed to move parallel to the Emitsburg Road, striking the Union flank. When Sickles moved forward, exposing the presence of the III Corps, it became clear that to hit the Union flank, the Confederates would have to hit Devil's Den and the Round Tops. The direction of attack was shifted well to the right, as shown by the red arrows. Even with this shift, the South didn't quite get enough force around the Union flank, though the 20th Maine's fight was a close thing. On the other flank, on the Confederate left, it was the South who left their flank exposed. The same II Corps units at the Angle that received Pickett's Charge on July 3 were able to pivot to their left to turn Anderson's flank. While Rodes was positioned to protect the flank of the attack as planned, he could not support the attack as executed. However, the best summary of July 2 emphasizes that it is not a General's job to win a battle. It is a General's job to put his men in a position to where they can win the battle. By all accounts, the fighting on July 2 was close. Longstreet's men did hit hard. Sickles men could not hold their extended line, and had to be reinforced haphazardly and desperately. Both the 20th Maine and the 1st Minnesota pushed themselves beyond normal limits to stabilize seemingly lost situations. In most prior battles, the south had won most of the tight situations. Whether the North was defending it's own soil, or defensive fighting left them more rested, or Southern attitudes had been shifted in marching and raiding through northern territory, for some reason the Northern enlisted men had the edge this day. On the other hand, it could be argued that the fighting was not truly close. Elements of the XII Corps had been moved from the Culp's Hill and Spangler's Spring area to possibly reinforce Sickles. They did not engage. They were not needed. The II and V Corps were sufficient to cover Sickles' retreat. Note also the head of the VI Corps column at the edge of the map on the Baltimore Pike. They were late, marching hard to recover from their excursion east to cover Early's and Stuart's presence near York.. However, had a few close fights gone the Confederate's way, while they might have taken and held Cemetery Ridge, they would not have had the force to roll up Cemetery Hill and Little Round Top. At some point, Longstreet's exausted and battered Corps would have had to deal with a fresh VI Corps. July 3rd: Pickett's and Pettigrew's Divisions, and parts of Pender's, Heth's and Anderson's make the charge. Part of Anderson's Division detaches, making almost a separate attack. Note the VI Corps, the only fresh Union unit, was used to patch weak points and protect flanks, but was kept to the south and rear area, able to reassemble moderately quickly. None of these anticipated weak points were hit. Longstreet did not want to launch Pickett's charge. He foresaw its failure. Can a general really optimize an attack he does not believe in? Would Stonewall have launched an attack with a nod, unable to speak, staying in the rear, waiting for failure? Yet, was not Longstreet correct? Would no 12,000 men ever born have been able to drive the Army of the Potomac off those heights? Many have blamed Longstreet for the failure of Pickett's Charge. One should remember, however, the words of Robert E. Lee following the attack. "It is all my fault."